While systematic research into teaching and learning has a rich history in education departments, their studies tend to focus on K-12 and are conducted by education specialists. SoTL focuses on higher education and is conducted by disciplinary specialists. SoTL is often described as a “young” field, but that newness is largely in name. Plenty of disciplines have an extensive tradition of studying how students learn in their fields: sociology, composition, and psychology, for example. Those who practice SoTL, however, point out that much of their research benefits teachers and scholars across campus, so SoTL is unique in its target of a multidisciplinary audience. The formal origins of SoTL begin in 1990. 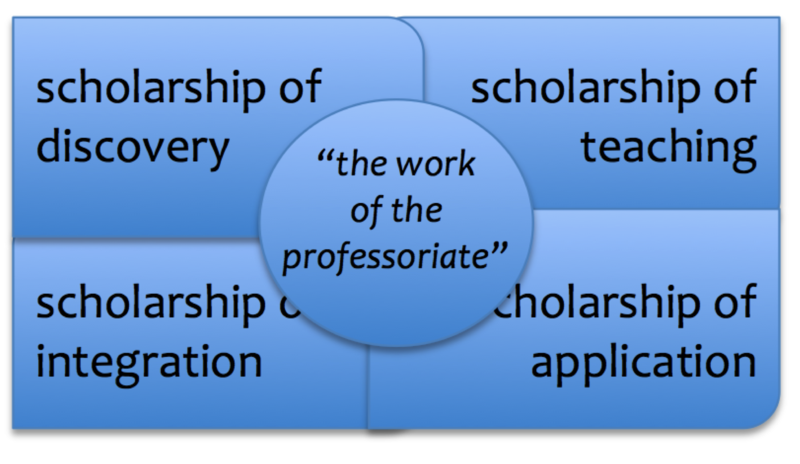 In an effort to define the scholarship performed by professors in academia as more than just “teaching versus research,” Ernest L. Boyer, in his influential book Scholarship Reconsidered: Priorities of the Professoriate (1990), concluded that “the work of the professoriate might be thought of as having four separate, yet overlapping, functions. These are: the scholarship of discovery; the scholarship of integration; the scholarship of application; and the scholarship of teaching” (p. 16). This conceptualization of scholarship elevates the traditional role of teaching from “a routine function, tacked on” to an essential component of a professor’s scholarly life. 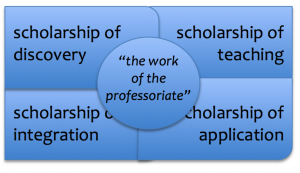 Furthermore, Boyer argued that the academy should recognize and reward all four components of scholarship, including the scholarship of teaching. These goals are familiar to faculty members from their evaluations of the scholarship of discovery (traditionally called simply “research”) yet are now applicable as standards of the other three scholarships. 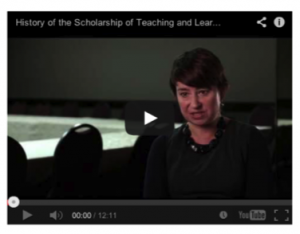 The video below offers some additional perspectives on the history of SoTL.